When I started thinking about how to integrate International Year of Astronomy into my 2009 What’s Up podcasts I naturally focused on Galileo’s first observations through a telescope 400 years ago. Over the first months of 2009 I had collected a gallery of Galileo’s first sketches, watercolors and engravings. These historic observations suggested a project I’ve been wanting to do for some time — to recreate all of Galileo’s astronomical sketches through a similar sized instrument. 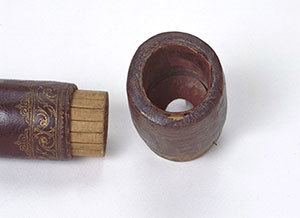 Galileo made his first telescope, a spyglass that magnified 3x in June or July 1609. Next he made an eight-powered instrument and presented it to the Venetian Senate in August. 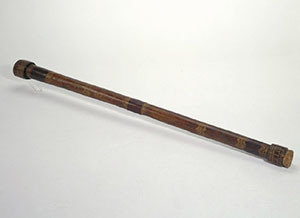 His next telescope, which magnified twenty-one times is the one he used to observe the bumps and shadows on the moon, Jupiter and its moons, and individual stars within patchy nebulae. These first observations were unveiled to the world in his book, Sidereus Nuncius published in March 1610. Galileo’s telescope, pictured above has a objective diameter of 37 mm and a focal length of 980 mm. The instrument’s magnification is 21. 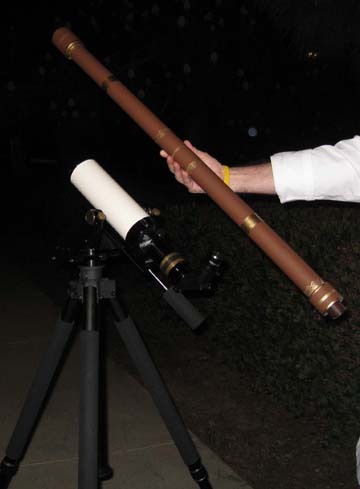 My Televue Ranger (ED Doublet Apochromatic refractor) has an objective diameter of 70mm, a focal length of 480mm, and using a 25mm Zeiss Abbe Orthoscopic eyepiece, yields a comparable magnification of 19. The field of view, however is dramatically different between the two instruments. Galileo’s longer focal length and smaller objective (which he also stopped down to lessen chromatic aberation) give a relatively small field of view – 15 degrees. My shorter focal length and larger aperture instrument has triple that FOV. What this means is that a telescopic view of Venus through both instruments will show the same size Venus, but in my ‘scope there will be more “sky” around Venus, and in Galileo’s there will be mostly Venus. A view of the moon is a different matter. Just a portion of the moon is visible at any one time through Galileo’s scope and the entire moon is visible through mine. Galileo’s drawings and watercolor paintings of the moon inspired me to sketch what I see through the eyepiece. I’ve been sketching since first light with my own first telescope over 20 years ago. This year, I’ll be honoring Galileo and celebrating the 400th anniversary of telescopic observations by creating 21st century sketches through a small refractor. I hope this journey back 400 years to revisit Galileo’s observations encourages you to look up. And I hope you’ll enjoy my sketches standing side-by-side with these historic first astronomical observations through a telescope! Jane thanks for sharing the wonderful artical, you made me remember my schools days when teacher use to teach about Galileo. will love to see your sketches standing side-by-side to great historic astronomical.